H-10-44 274 at Tulsa Tower (MP 423.0) interlocking (date unknown). Locomotive is westbound on the North main track of the Cherokee Subdivision at the Tulsa Tower (MP 423.0) interlocking. The interlocking is five blocks east of the Tulsa Union Depot (MP 423.5). This multiple railroad junction is southeast of the intersection of East Archer Street and North Greenwood Avenue and northeast of the intersection of North Greenwood Avenue and East 1st Street. At this point the railroad crossed the Atchison, Topeka and Santa Fe (ATSF), the Midland Valley Railroad (MV) and the Missouri, Kansas and Texas (MKT or Katy). In 1967 the Midland Valley was merged into the Texas & Pacific Railway (TP). 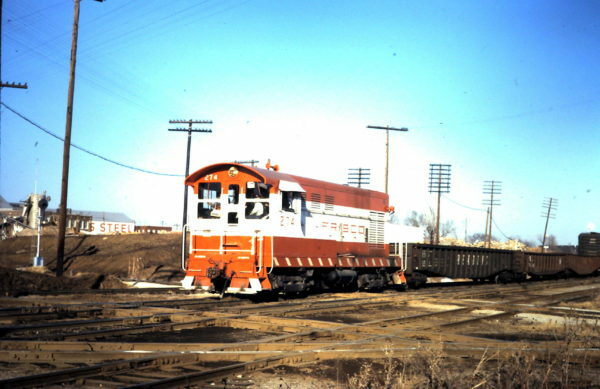 In turn the TP was merged into the Missouri Pacific Railroad (MP or MoP) in 1976. In the image the track under the locomotive’s fuel tank is the ATSF. From their yard to the north this line crossed the Frisco to their freight house on the southeast corner of East 1st Street and South Elgin Avenue. This structure has been repurposed as offices and stands today. The diamonds ahead of the locomotive’s pilot are the MV/TP/MP crossings. The MKT’s diamonds are near and parallel to the bottom of the photograph. This entry was posted in FT Collection and tagged 274, Fairbanks-Morse, H-10-44. Bookmark the permalink.